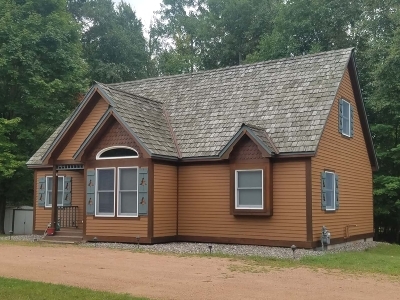 Custom built home in the Northwoods! This is a year round chalet style home with forced air heating, central air, conventional septic, drilled well, natural gas, phone, cable and high speed internet. There are 3 bedrooms with an open concept main living area, main level laundry and large bathroom. The home has that much desired Northwoods appeal with wood floors, vaulted tongue & groove walls and ceilings and accent beams. The kitchen has beautiful Rustic Hickory cabinets with snack counter and wet bar. Mostly wooded lot with a large front lawn. Location, location! 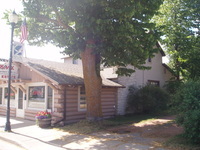 You are a mile from town (schools & shopping) and on the snowmobile, atv, hiking/biking trail! Property is zoned general business...use as office space, retail or build a large shop area that could host a number of different types of businesses.